I started training in 1997 with a club which was a mixture of the Goju and Shotokan styles. Late in 2002 I began training in Jujitsu with Sensei Paul Marston of the Sozokan Martial Arts Academy in Perth and in 2004 I commenced training in Japanese Kobudo, also at Sozokan. After leaving my former karate club I trained with a local branch of Kofukan Shito-Ryu and was graded to 2nd kyu. Over this period I also travelled to Brisbane Queensland on two separate occasions to train with Sensei Bob McMahon of the Australian Karate Academy and graded to Shodan under his syllabus in December 2004, after I had left Kofukan. After unsuccessfully searching for a suitable club within a reasonable distance it was suggested that I start training and teaching locally and travel farther a field periodically to train with others, and after much contemplation Kitsunekan was founded. At present I train regularly in Kobudo with Sensei Paul and occasionally step onto the mat for jujitsu practice, as well as travelling to southern Perth to train with Kyoshi Chris Hoath (Coastal Shotokan Karate Australia) whenever possible. 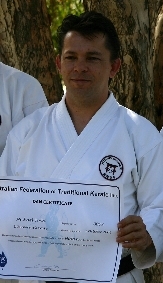 Most recently, in October 2006, I attained the rank of Nidan under the auspices of the AFTK at the AFTK WA Seminar and Dan Grading held in Perth. Kitsunekan is a form of traditional karate. We wear dogi (the uniform) and practice various karate kata (forms or patterns). It is not "style" karate in as much as we are not aligned with any of the major styles (Wado, Goju, Shotokan, Shito-Ryu etc). But it is not "free-style" because it is not "the best bits of xyz martial arts all rolled together", a common advertising claim. We utilise older forms of the basic kata such as Pinan and Naifanchi for training and practice modern Shito- or Goju-Ryu kata for more advanced students and competition purposes. Karate was, is, and should be, a simple but effective means of self defence intended to be used only if necessary. The kata of karate are a fundamental means of practicing self defence, but practice of kata alone will not make someone able to defend themself. An understanding of what techniques are contained in the kata are necessary otherwise it is merely a performance routine. The greater part of training time in a Kitsunekan dojo is spent practicing and learning with a partner so that then the solo practice of kata becomes useful. Kitsune is the Japanese word for fox. Foxes are a common subject of Japanese folklore. Stories depict them as intelligent beings and as possessing magical abilities that increase with their age and wisdom. Foremost among these is the ability to assume human form. While some folktales speak of kitsune employing this ability to trick others — as foxes in folklore often do — others portray them as faithful guardians, friends, lovers, and wives. According to beliefs derived from fusui (feng shui), the fox's power over evil is such that a mere statue of a fox can dispel the evil kimon, or energy, that flows from the northeast. 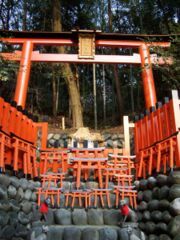 Many Inari shrines, such as the famous Fushimi Inari shrine in Kyoto (right), feature such statues, sometimes large numbers of them. However the true meaning of the name is far more prosaic than suggested by such a mystical connotation. Mick was using Sionnagh as his ID on computer bulletin boards in the early 90s, several years before the internet became readily accessible in homes. Sionnagh is Gaelic for "fox", a derivation of his last name (Todd) which is Gaelic slang for "fox". When it became necessary to find a name for the club Kitsune seemed a reasonable choice.